Now that I have more time on my hands, my thoughts have turned to baking. It's not something that comes easily to me. I was talking to my sister over the weekend and we both agreed that to us, baking seems like more work than cooking. It's more of a hassle, you have to be more exact with measurements and ratios, you dirty up more equipment, and it's harder to keep the kitchen clean. That being said, there's nothing like the warm, toasty smell of something sweet baking in the oven. And now that I'm watching what I spend, I'm less inclined to indulge in any impulse chocolate or ice cream splurges. So I was just sitting there minding my own business the other night, watching TV, getting caught up on all the old episodes of NCIS now that I've gotten hooked on that show (to which again, I say "damn those marathons!"). From out of nowhere it came, the desire for something sweet. But I had nothing sweet in the house. I did not feel like doing any heavy baking (see above), so I racked my brain for something quick and easy. And I thought of Chess Pie. Chess Pie is an old southern tradition, apparently. I did not know that, even though I grew up with it. It was available pretty much every day at every school cafeteria in which I spent my lunch hours, elementary through high school, and it was a favorite. 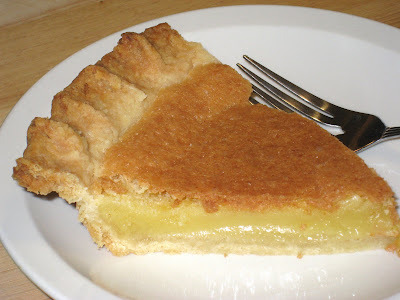 Every once in a while they would go all out and offer lemon chess pie, which was good, but I actually preferred the original plain vanilla version. There is some question about where the name comes from. One theory is that it comes from the British "cheese" pies, so-called because of their custardy (cheesey) textures even though they contained no cheese. Another story (and the one I personally like although it doesn't seem likely) is that a dinner guest, inquiring of the cook what kind of pie it was, received the answer "It's jes' pie." I don't know where I got my recipe. I think it was from a cookbook but I can't remember which one, and this recipe doesn't match any of the ones I found online. I started making it because it looked so easy, and I already had most of the ingredients around. Except for the pie crust, of course, but in those days I thought nothing of buying pre-made crusts. But I did not have any ready-made piecrust available. And these days, of course, my standards are higher and my budget is lower, but I decided not to let that deter me from satisfying my sweet tooth. I decided it was time I tackled the art of the home-made piecrust. 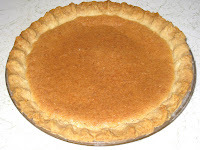 I did a little searching for a recipe that did not use shortening, and I was lucky enough to find Elise's recipe for All-Butter Crust for Sweet and Savory Pies (Pate Brisee). I love Elise's site. It is full of wonderful recipes and beautiful pictures. Her piecrust recipe was straightforward, and in very little time I had my piecrust ready. It only takes about five minutes to mix up the custard, and half an hour to bake it. The hardest part is waiting for the pie to cool. Once it does, it's pure sweet heaven. After doing the breakdown, it's easy to see why it was such a staple in the school cafeteria. It's really cheap! Melt butter, add other ingredients and mix well. Pour into pastry shell and bake at 350 deg. for 35 mins. I understand congratulations are in order for you on quitting your job. Good luck in grad school! Thanks for stopping by, and for the kind words. Healthy Life Bread: All Natural?